A long overdue new hair post is here! 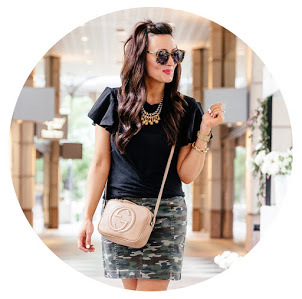 I get asked all the time about how I style my everyday loose curls and to be honest, the hair post that I did a year or so a go is still pretty current, I’ve just switched a couple of things up! 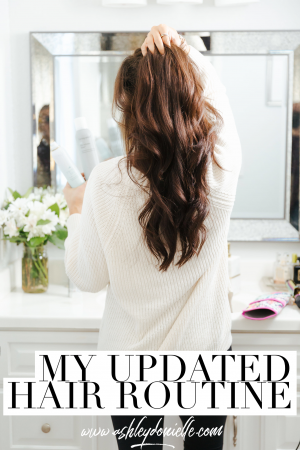 Especially after having Eloise and losing what feels like an entire scalp full of hair, I’ve found some products to be super helpful in bringing back my healthy thick locks. 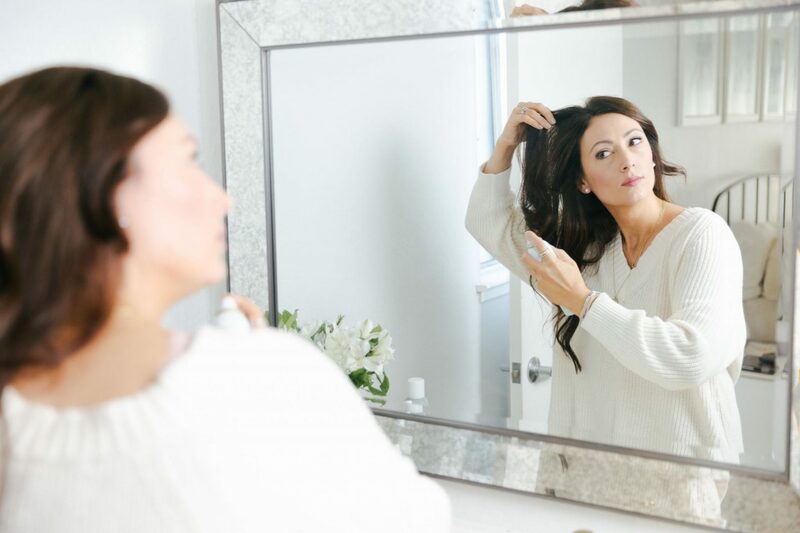 First and foremost, I think there are three products that have been total game changers in making my hair feel AND look healthy, shiny and thick. I’ll explain how and when I use these products below, but I highly suggest trying at least 1 of these 3 products if you are struggling with dry, dull or frizzy hair. 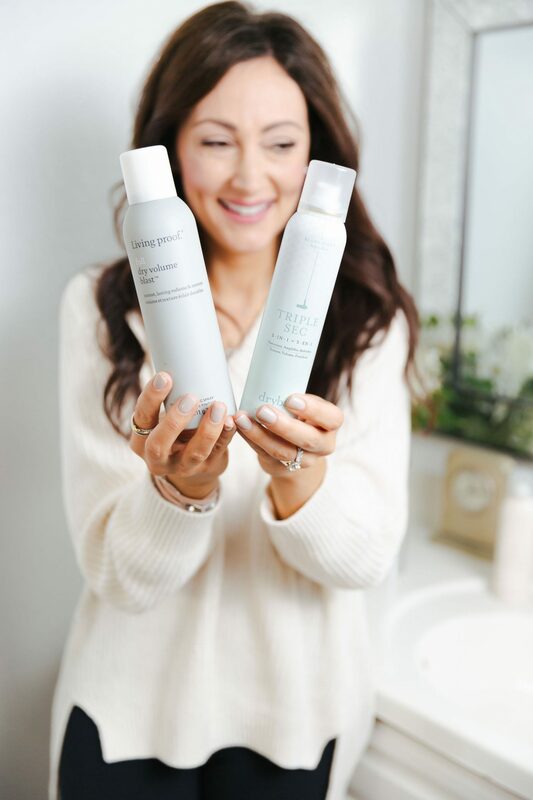 I use to swear by Pureology shampoo and conditioner but decided about a year ago to switch to the Kirstin Ess for Target line and I honestly couldn’t be happier! It’s so affordable and actually is a VERY amazing shampoo & conditioner for the price! It smells fantastic and actually makes my hair smoother and easier to style. Once a week, I will also use this deep conditioning mask in the shower (I’ll leave it on for about 5 minutes while I shave my legs) and I feel like that helps with hydration as well. PS. I only wash my hair twice a week as I feel like that helps keep it healthy! After I shower and wash my hair, I wrap it in a towel for about 10-15 minutes before applying heat to it. After about 10 minutes, I spray my whole head with this Prep spray and then comb through with a just a normal brush. I then mix two pumps of the Caviar CC Cream & 2 pumps of the Kirstin Ess Shine Serum and run that through my hair while wet BEFORE blow drying (I apply more of the product at the bottom ends of my hair and only a little bit on the top of my scalp). These two products are KEY for me as I really feel like they help with frizz while drying, create shine, protect and keep my hair looking healthy. 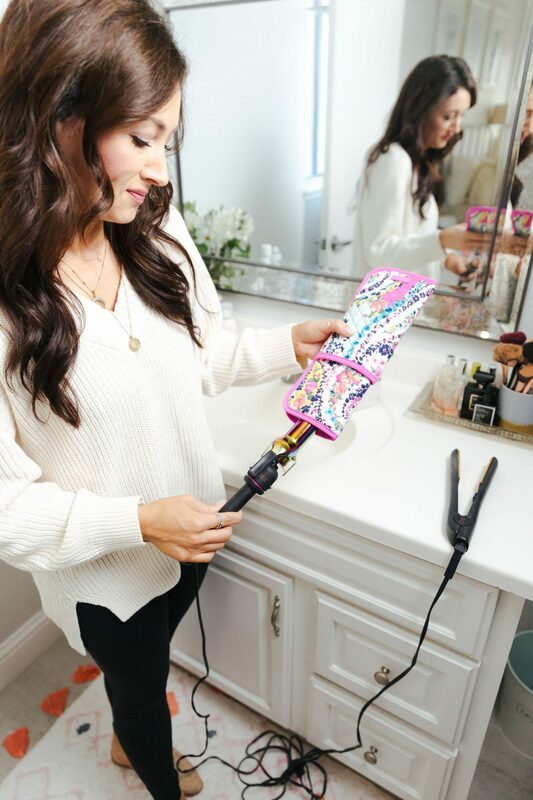 I use this blow dryer and love it as it only takes me about 6-8 minutes to dry my thick head of hair. I have naturally curly curly hair, so even after I blow dry it, I still have kinks that need to be smoothed over. 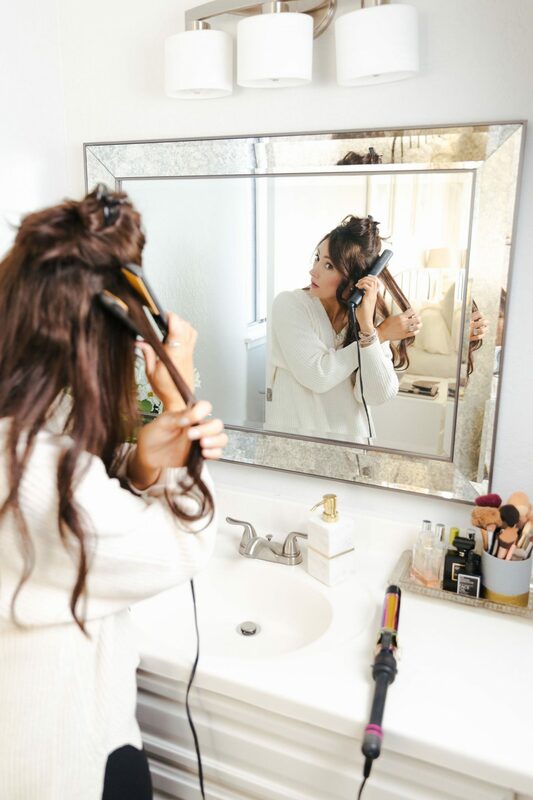 I use a Chi straightener (that I’ve had for well over 7 years and can’t rave enough about) and a 1 1/4 curling iron to create smooth loose everyday curls. 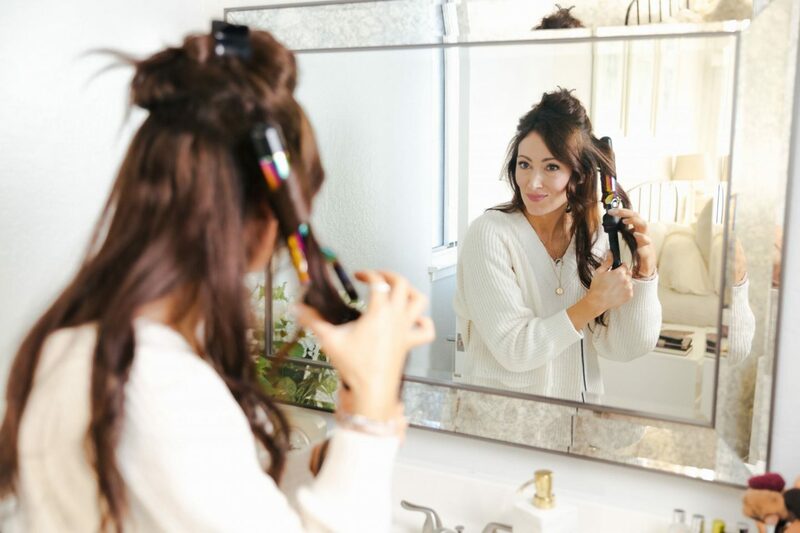 I section my hair off into 3 sections (easier to curl and see the pieces) and spray each section with the Quai Memory Mist before curling. The Memory Mist acts as a heat protectant while adding MAJOR shine AND it helps your curls stay for days. When I first tried this product, I didn’t feel like it was working so I stopped using it and could totally tell a difference. 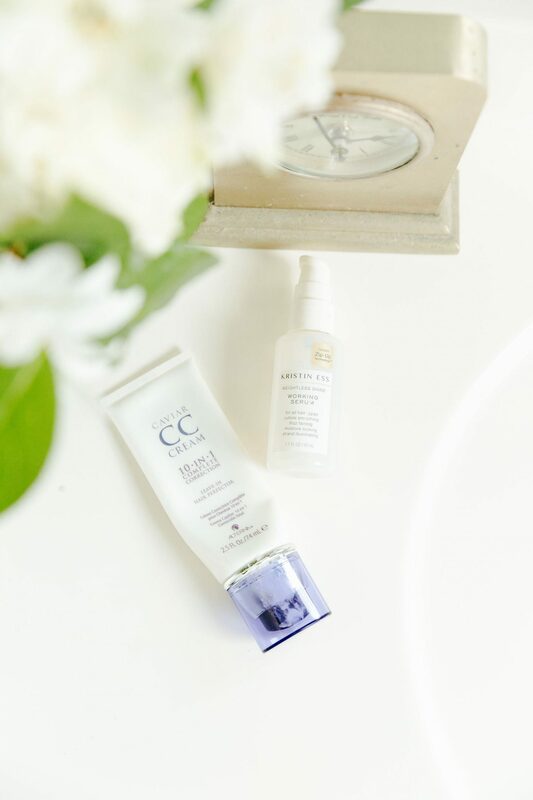 If I use the Memory Mist, I don’t even need to touch up my curls the next day as they are still there! It’s a game changer! (It’s a little pricey, but one bottle lasts me for about 4 months!). 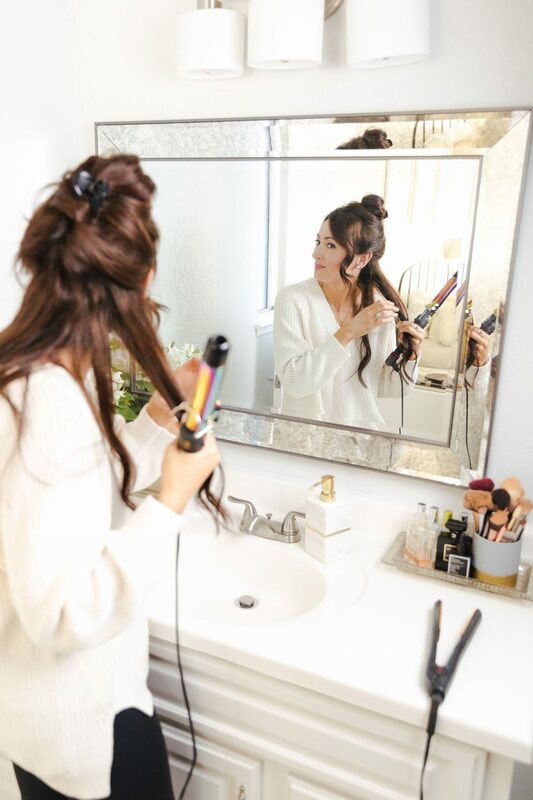 I use the straightener at the root of my hair where the kinks are and then I take medium size pieces from each section and curl them one by one. I curl the hair AWAY from my face each time and leave about an inch at the end out of the curling iron. After I’m done curling, I let my hair sit and cool for about 10-15 minutes (I don’t run my fingers through it or a brush, I just let it be for that time). I then spray a little bit of Triple Sec at the roots (rubbing it into the scalp) to add volume. I will then comb my fingers through my whole head of hair to create a looser looking curl. If my hair is frizzy in a spot or two, I will take that same CC cream that I used while my hair was wet, and run a small amount through my ends. PS. I switch back and forth between Triple Sec and Living Proof Full Volume Blast for added volume. 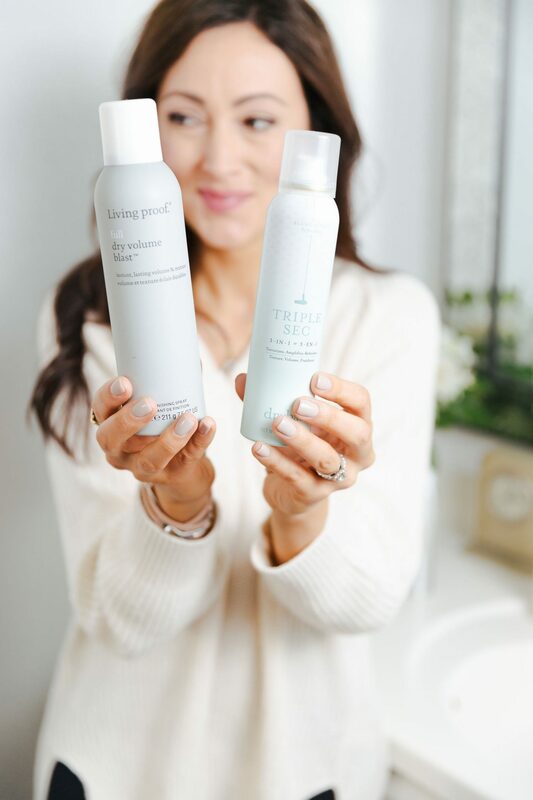 Both are AMAZING products that actually do add grit and volume to your hair, but if I had to choose one, I would choose Triple Sec as it also can act as a dry shampoo for day 2 or 3 hair! I then spray my whole head with this hairspray which I’ve been loving (a medium hold). 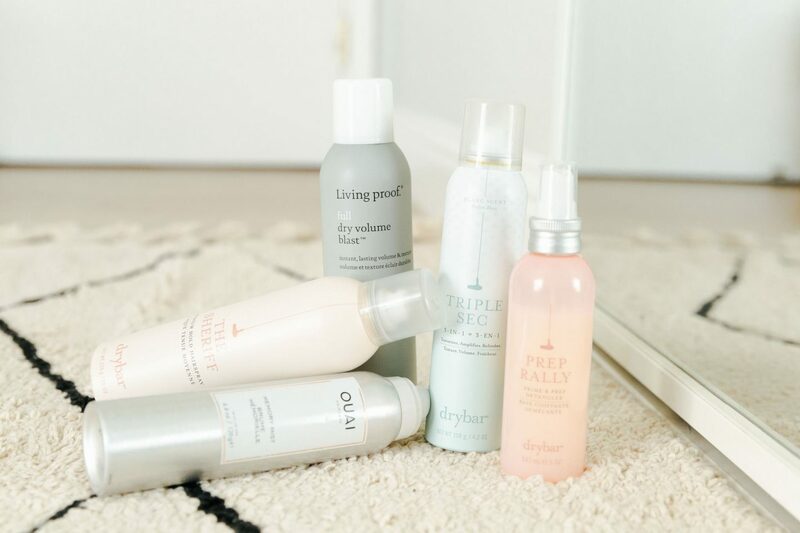 (The Full Volume Blast is a very strong product, so if you like a ton of volume and love a lot of texture in your hair, then that one is for you!). 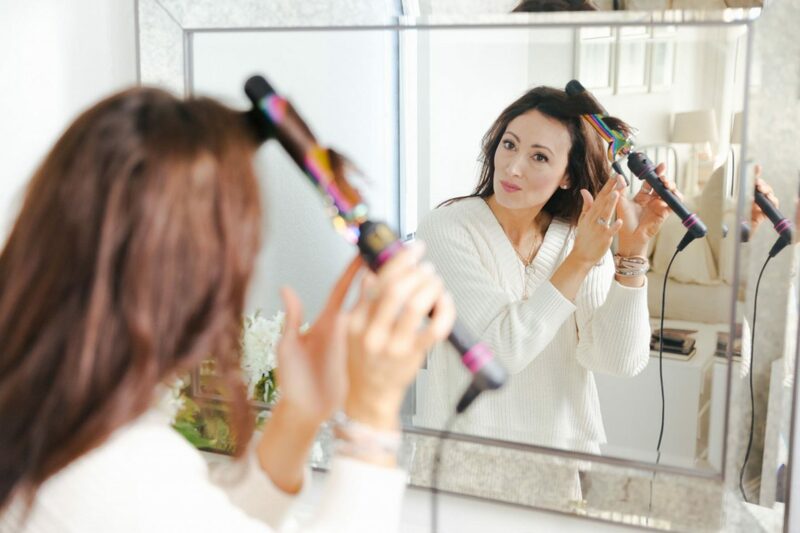 I think that loosing hair after baby is definitely inevitable but I think that there are some things to help prevent you from loosing your whole head of hair (isn’t it CRAZY what we women have to go through?!). First and foremost, my doctor told me to keep taking my prenatal vitamins and I did for almost 7 months after I had Eloise. (I then switched to a women’s daily vitamin). I think this really helped! Also, using a hair mask of some sort at least 1-2 times a week was a tip I got from the doctor too. 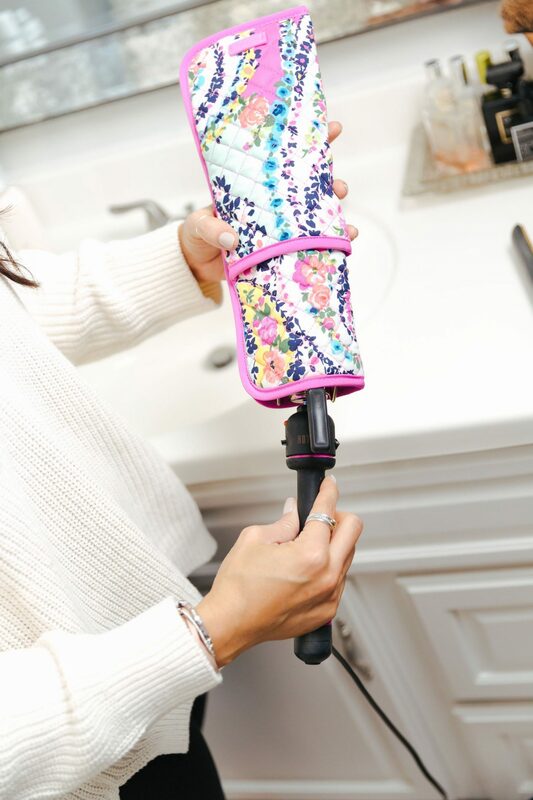 If you all don’t have these curling iron/straightener holders, you should definitely #addtocart! I can’t live without mine. 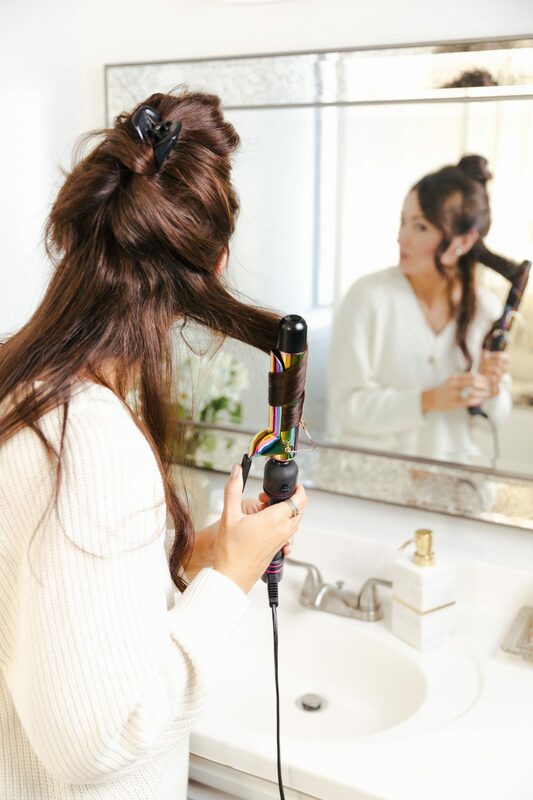 They are lined so that you can put your hair tools inside even if they are still hot so it makes for a fast clean up and they are amazing for traveling. I hope you all enjoyed this updated hair post! I’ll be chatting more about the products in my Instagram stories today, so make sure you head there to check it out! One thing that really seemed to help by postpartum hair loss is taking a DHA supplement. The postnatal vitamin I take have DHA but I take an additional supplement as well (took it along with my prenatals the entire time I was pregnant too). I ran out for about a week and noticed that my hair loss significantly increased and when I started taking them again it slowed again after 3-4 days. I’m 8 months postpartum and it seems to have finally stopped falling out and growing back but I’m still going to keep taking them until at least a year. I also can’t stand the fish oil kind so I found a great non fish oil kind that I love!